Due to the continuing interest in the sky loop antenna, I’ve put together some notes and suggestions on the construction of these incredibly well performing antennas. One note – the sky loop is generally used as a receiving antenna. I don’t have any first hand experience using one for transmitting. Typically, the SWR is all over the place, so you’d likely need a tuner if you wanted to transmit with one. For receiving, no tuner is needed. The sky loop covers all of HF, and often down into MW as well, depending on the size. First, the basics. A sky loop antenna is a large loop of wire mounted in the horizontal plane. How large? Typically, as large as you can make it. Bigger is generally better when it comes to sky loop antennas. Mine has a perimeter of 670 feet, and I am considering enlarging it. Often, this antenna is run around the property line of your yard, maximizing the length of the antenna as well as the cross sectional area. While the antenna is called a loop, this does not imply that it needs to be circular in shape. While a circle does maximize the area for a given length of wire, other shapes work well. Remember, you’re trying to maximize the amount of wire (perimeter of the loop shape) and area, so try to use as much of your yard as possible, although you don’t want to zip zag back and forth too much. You want to make the largest area polygon that you can. The likely constraint will be what trees or other supports you have available for getting the wire in the air. And of course, remember that safety is important – keep the wire far away from any overhead power lines. Because the antenna is in the form of a loop (a continuous path of wire from one of the transmission line terminals to the other), it is inherently a low noise antenna. Comparing a sky loop to a dipole, you will find that the noise levels are generally much lower. How to get the wire in the air? 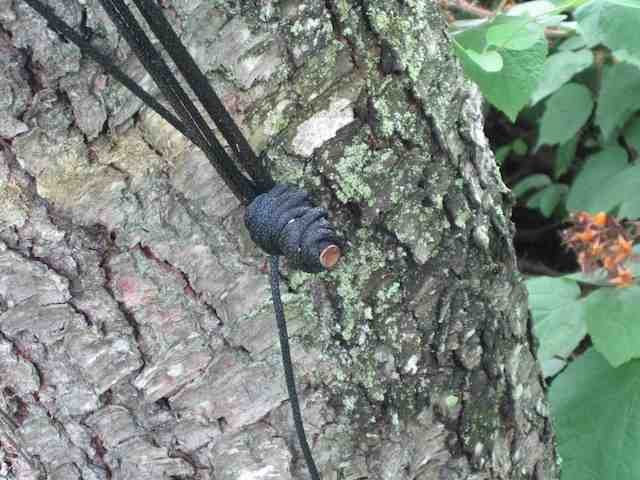 There’s lots of ways, what I find that works best is to put rope up into trees around the path I want the antenna wire to run. One end of the rope has an antenna insulator, the rope then goes up over the tree (or a branch or whatever you can manage) and the other end is secured to keep the insulator up in the air. I just put a large nail in the tree, pull the rope taut, and then wrap it around the nail several times to secure it. often I will put a second nail in the tree as well, a few feet below the first, and then coil the excess rope around the two nails, to keep it neat and tidy, and away from rope eating lawn mowers. Untying rope that’s been wrapped around mower blades is no fun. Been there, done that. I use an EZ Hang to put rope up in trees. The antenna wire itself then runs through the other end of the insulator. Since the wire is in a loop, this requires some planning, you need to put a bunch of insulators on the antenna wire, as many as you will need, and then use one for each of your antenna support ropes. The EZ Hang shoots a fishing weight up and over the tree. There’s fishing line attached to the weight. Once the weight lands on the other side of the tree, I take off the weight, and attach the end of the rope to the fishing line. Then I use the reel on the EZ-Hang to pull the rope back through the tree, until it gets down to the ground at the EZ-Hang. Now I’ve got the rope going up and over the tree and back down. Then I can cut the rope off the spool, and attach an insulator (with the antenna wire already running through the other eye) to one end of the rope, and pull it and the antenna wire up into the air. If your antenna is relatively small, you may get away with just four or so insulators, one at each corner of the loop. As the antenna gets larger, you end up with a lot of sagging due to the weight of the wire, and you need several intermediate support insulators on each side of the loop, to limit the sagging. As far as the type of wire to use, there’s several possibilities. First, of course, is normal stranded copper antenna wire. I, however, got a great deal on a 1000 ft spool of #16 insulated wire. 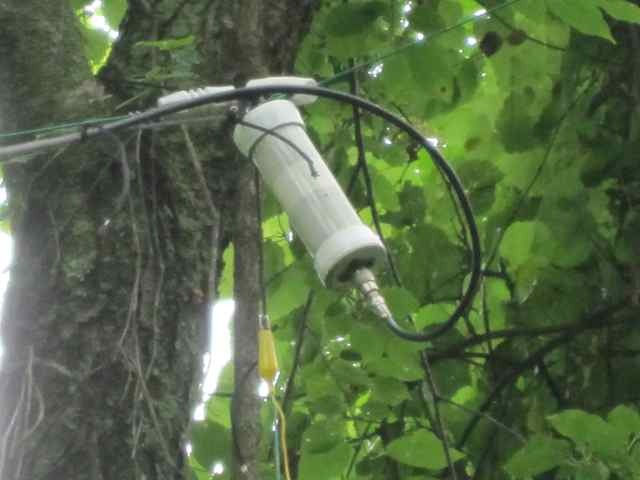 I went with that because the antenna wire would be going through trees and leaves, and wanted to minimize the chances of the wire being shorted out to ground. While probably not as important with a receiving antenna like this as with a transmitting antenna, I decided to play it safe. Also, the insulation happens to be green, and I think it does a good job of helping the wire to blend in the trees, making it difficult to see. There’s a lot of debate as to how high the wire for a sky loop antenna needs to be. Computer modeling shows that the higher it is, the better it is at picking up low angle signals from DX stations. And in general with HF antennas, higher is better. On the other hand, if it is difficult for you to get the wire up very high, a sky loop with low height wire is still going to perform better than no sky loop at all. I started out with several sides of my sky loop being relatively low, 15 ft up or so, because that is what I could easily manage. Then, over time, I have raised those sections as I was able to. I do think the antenna performs better now that it is higher up, but I am not sure that the effects are dramatic. So my rule of thumb would be to get the wire up as high as practical, but I don’t believe there is any magical height you must achieve. Right now, the height varies between about 25 to 50 feet. As I mentioned at the beginning of this article, the SWR (and feedpoint impedance) of a large sky loop antenna is all over the place. If you think about it, for many SW bands, the antenna is several wavelengths long. In my case, the antenna is about 670 (206 meters) feet in perimeter. So for the 43 meter pirate band (say 6.925 kHz), it is about 4.75 wavelengths long. At 15 MHz, it is over 10 wavelengths long. That said, I do not use an antenna tuner. While you could, I don’t think it is necessary for receiving applications. The antenna collects lots of signal, and I don’t believe you need to squeeze out the last S unit. Since the impedance is usually quite high at any given frequency, I chose to feed the sky loop antenna with a 12:1 balun. I didn’t choose this based on any calculations, I just happened to have one available. I do keep meaning to try swapping other baluns, such as a 4:1 or even a 9:1, to see if there is any difference in the performance, but I have not gotten around to it. I do think some sort of balun is desired for the sky loop antenna, vs feeding it directly with just coax. You may be able to feed it with ladder line, but I have not tried that. For the coax, I used RG6, which is commonly available and used for TV. I chose RG6 because it is very cheap, and personally I am sick of putting PL-259 connectors on coax. RG6 has F connectors, and I use an F to PL-259 adapter at the balun, as well as to connect to the radio inside the shack. There’s certainly no requirement to use RG6, you can use any good quality coax. Performance does suffer once I get down to about the middle of the Medium Wave band. While I can pick up stations all the way down to 530 kHz, the signal strengths are much less than the upper end of the medium wave band. If you assume the antenna is a basic loop, the resonant frequency is about 1460 kHz, so this seems reasonable. I get excellent reception in the X band, 1600-1710 kHz. One of my reasons for wanting to increase the length of the loop is to hopefully get better performance lower down in the MW band. Although simple math shows that even if I doubled the length (which I am not sure I could do), the resonant frequency would still only be about 730 kHz. Another possibility for worse performance on the lower part of the MW band is the choice of balun, as I addressed above. The impedance of a one wavelength loop antenna is about 120 ohms. With a 12:1 balun, that is reduced to about 10 ohms. And at the lower end of the MW band, the impedance is likely much lower. If you’ve read my This is why you should disconnect your antenna during a storm article, you’ve seen what happens when you have a thunderstorm nearby. Your antenna is often quite good at collecting that energy, and sending it to your radio. There’s lots of good lightning protection devices out there that you may want to look into. Personally I also disconnect my antenna when there’s a storm, or even the possibility of a storm, especially if I am not going to be around. It takes a few seconds, and can protect your radio. It doesn’t take a direct lightning strike to damage a radio. I hope this article will motivate several listeners who have the room to consider installing a sky loop antenna. You won’t be disappointed. This entry was posted in Antennas, Shortwave by Chris Smolinski. Bookmark the permalink. Good stuff. My experience is similar to yours. The loops is a very good all band performer. I just feed my 275 foot (80 meter band) with coax, no balun, as stated in the arrl antenna handbook. I use it for both transmitting and swl’ing, but mostly swl’ing. Great all around antenna. It certainly got me motivated. I strung up about 270ft of wire around the garden, using a couple of trees and the guttering of the house. Fed it with about 5m of 450 ohm ladderline, then initially straight to the tuner with 15m of 50 ohm coax, and I must say it works superb compared to my endfed with a 9:1 UnUn. I tried the UnUn on the loop, was useless, so today I made a 4:1 Balun andseems to have quietened the noise down a little, especially on 80m. So to all out there considering a sky loop, just have a play, it doesn’t seem to matter much how long, how you configure, or feed them, they just work very well. Good luck and thanks to Chris. They’ve pre-made excellent skyloop antenna. They’re amazing performers. Hi Chris. I like loops too, but in the vertical plane in my case, suspended between 2 tall trees. 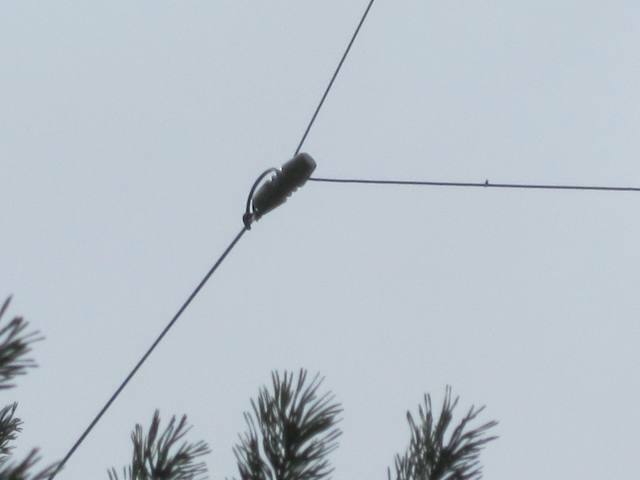 Getting a rope high in the trees is the biggest challenge, keeping it there is the next challenge … but I find it helps immensely to (a) use a complete loop of rope over the tree so you can pull the antenna connection up AND down as necessary e.g. to reconnect it if it breaks, and (b) use a weight to keep a fairly constant tension on the rope even as the tree sways around in the wind. It has much more ‘give’ than a nail in the tree! For weights I have used fire logs with galvanized screw eyes, half breeze-blocks, concrete lumps etc., whatever’s handy really. Bungees work too, connecting the rope to a fixed point – again, the trick is to avoid it going so tight that it snaps … and in some situations, a deliberate weak point in the rope connecting the antenna to the rope acts as a ‘fuse’ that opens in a storm without wrecking that rope loop over the tree. One more idea is to use strong fishing swivel connectors to release the twists that form as most ropes are tensioned – and/or use braided rope that doesn’t twist as much.